Today we’ll be taking a look at the 2948 Roughneck Boot from Red Wing. This is the second pair of boots from Red Wing to be featured here on BestLeather. You can read about their iconic Iron Rangers here, if you’d like. The Roughnecks are part of Red Wing’s Heritage footwear line, which relies heavily on boots designed decades ago that have proven their worth in hard working environments. Today, most of the heritage line of boots are worn in casual settings. But, they’re certainly made well enough to withstand the rigors of any type of manual labor you may throw at them…and you’ll be looking darn good while you’re at it! The Red Wing Roughnecks are made with a waxy, polished leather they refer to as Spitfire Leather. It has a smooth, shiny look to it, enough to look somewhat dressed-up but not overly fancy. It looks very similar to what is commonly called rough out leather. It has a rugged, somewhat pebbled look to it. Right out of the box, it looks like it’s been worn and aged, which definitely is in line with Red Wing’s heritage vibe. It’s quite an undertaking to create a pair of Red Wing boots. They utilize over 230 steps in their production. The end result is a solid, sturdy, well built boot. 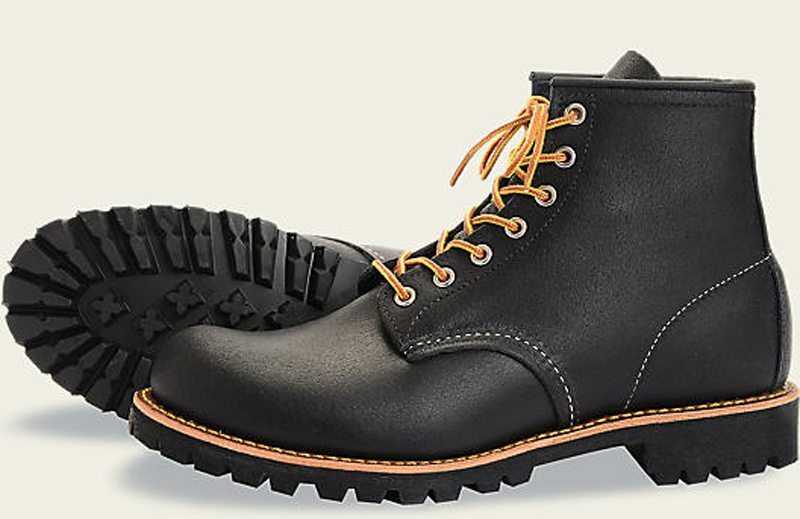 The boot is built onto a hefty Vibram lug sole with a Goodyear welt construction. It’s a pretty no-frills boot, with the contrasting welt and stitching being the main features that stick out. The boot has a rounded toe with no embellishments. The Vibram sole, as always, is bulletproof and provides excellent traction. I have been surprised at how comfortable these boots are given the minimalistic design. There is no padding in the shoe, which was intimidating at first, but the leather and the welt all break in well to the foot and provide a solid, comfortable, supportive base. The boots are somewhat challenging to put on since they do not have speed hooks and must be laced through traditional eyelets. The only addition I might make would be a tab or loop on the back of the boot you could use to assist with pulling them on. I’ve found that the boots work well in a wide variety of situations. The black spitfire leather looks best with jeans or chinos – great for getting just a little dressed up. Their style and sole design is a bit too rugged for any type of formal or semi-formal setting. They’re best used in a work or casual environment. 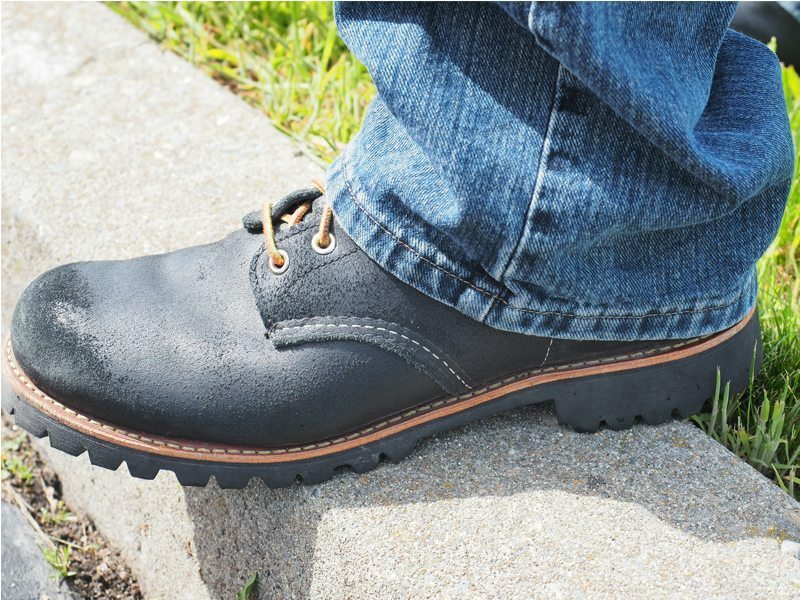 For a boot that’s under $300, it’s hard to beat the Red Wing 2948 Roughnecks. This is a tried and true, time tested design with lots of solid customer satisfaction behind it. If you’re looking for a boot to serve in multiple roles and looking for one that will last for many years to come, I highly recommend that you consider the Red Wing Roughnecks.